German4All is your personal assistant for learning and proper use of German Language. German4All is just a great app for German language that fits in every pocket and can be used every time and in all situations.Using German4All you can quickly learn to speak grammatically correct German Language.Key features: * User friendly navigation menu* Translate between German and all most spoken World's Languages. * Learn German Nouns, their Articles and Declension of Nouns. * Find out how to conjugate German verbs in present, perfect and future. 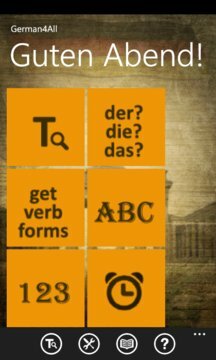 * Learn German Alphabet and Spelling Rules. * Learn how to read and pronounce German Numbers. 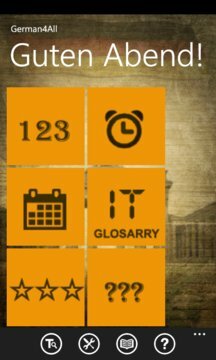 * Use offline IT Glossary to learn new words.